Run For Your Lives | JustRunLah! Run For Your Lives is the original zombie run straight from the USA, brought to you by Action X Pte. Ltd. A 5K obstacle course with a twist, there have been more than 30 successful infections all over North America since 2011. Pitting survivors against zombies, it is not how fast you run, but rather how well you run that matters. Masses of hapless runners will be donning belts worn around their waists. three flags will be dangling precociously on these belts, representing their fragile lives. As they make their way through the treacherous course, they will encounter zombies who will attempt to grab these flags and whittle their lives away. If they make it to the end with at least one life flag remaining, they have outmaneuvered the undead and well deserving of a coveted survivor medal. Otherwise, they can celebrate being part of the infected with a shiny new medal to confer their new status. The course is only half of the fun. 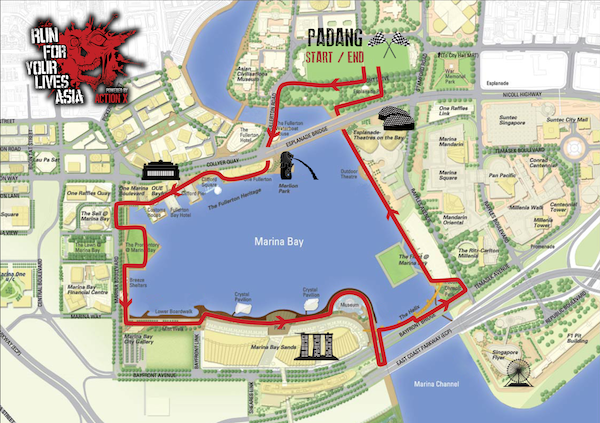 Run For Your Lives Singapore will play host to a mega Apocalypse Party filled with food and drinks amidst a myriad of activities and entertainment. Expect a carnival-like atmosphere with lucky draws and games while rocking out to bands and DJs like there is no tomorrow.